I’ve often thought that there’s a time and place for a Sunday-afternooner in the film world; a style of film that’s almost a subgenre, given how many movies will fit into the category. Something not too loud, not too quiet, not too funny but not too dramatic – the perfect viewing whilst you’re peeling potatoes for roast spuds, or searching through cupboards for the dried rosemary that you were just sure was there last week. It’s the film that’s on TV whilst you’re entertaining your grandmother, who’s already two sherries and a 30-minute nap deep. The Sunday-afternooner. Eaten by Lions is one of those films. A charming family comedy with a sentimental streak for your mother and an occasional cheeky chuckle thrown in for Dad. It brings a new level of artistry to the word ‘inoffensive’ – there’s nothing really wrong with it, but there’s nothing that’s amazingly, brilliantly right with it, either. 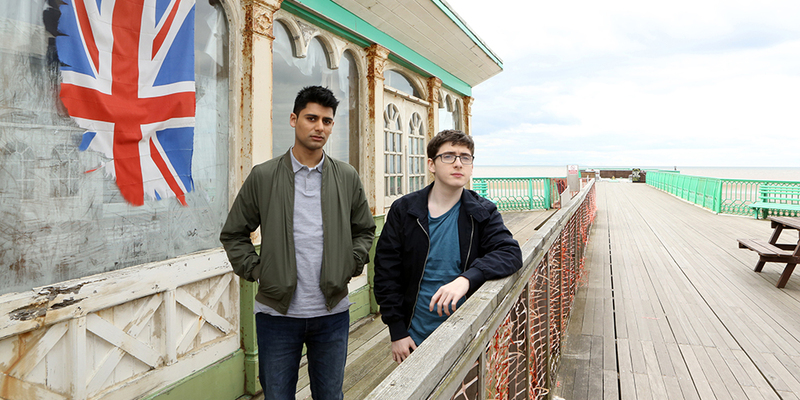 What it does have in its favour, though, is a solid couple of turns by its two lead actors, Antonio Aakeel (Omar) and Jack Carroll (Pete), who’ve got some cracking chemistry. After the death of their grandma, half-brothers Omar and Pete decide to make the titanic voyage from Bradford to Blackpool in search of Omar’s biological father. What ensues is a gentle comedy with touches of emotional weight – both of which would be substantially lacking, were it not for Aakeel and Carroll’s charming buddy duo. They’re both innately likeable, and form a strong basis for holding together what is, ultimately, not a particularly astonishing story. The difficulty in critiquing a film that’s so – to use the word again – charming, is that it’s hard to pull it apart without feeling like you’re being supremely unjust. This isn’t a film, after all, that was destined for the awards circuit or for Auteur Hour at the Curzon. It’s a film that’s quite happy to be mild – and so serves its purpose. And it’s hard to find fault with a film that does everything it’s meant to. Eaten by Lions is easy to enjoy if you go into it knowing that you’re about to watch a twee British family comedy, and one of the things it does very well – which I can imagine won’t translate in the slightest to any international audiences – is play on its complete Britishness for laughs. There’s a snarky ice cream van-man, a Northern Derek Acorah-esque fortune teller whosits on Blackpool pier and bullshits about tarot cards, and a rundown B&B that’s currently being inhabited by a “stag do from Cleethorpes”. Johnny Vegas is there – just playing Johnny Vegas in a bob wig and a kimono. The location for the “ten-night stand” that sets up the entire film’s premise? Rhyl. What makes most of the film’s humour funnier is the specificity, normality, and, frankly, British-ness (without being all teabags and monarchic about it) of the jokes. One of the film’s strong points, though, is a real dedication to creating a visually gorgeous film – and here it’s worth commending cinematographer Matt North. 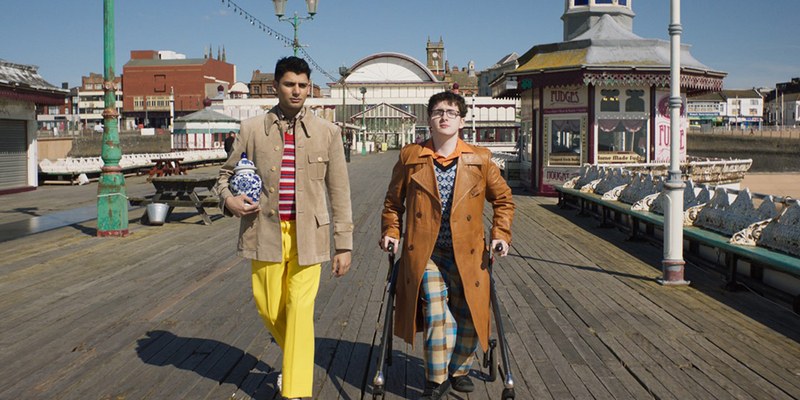 In celebration of the sheer Blackpool-ness of the whole thing, there’s colour thrown across the screen, from the neon lights of the pier to Omar and Pete’s horrific 70’s attire, to love interest Amy’s bright pink hair. We get given lots of lovely shots of the sun setting over the sea, some whimsical Wes Anderson-esquepastel symmetry, and a gorgeous custard-yellow Rolls Royce. But with a film like Eaten by Lions, it’s best not to look too deep. On the surface, what you get is a cute, inoffensive, family comedy – and that’s exactly what it is. And do you know what? That really does have its place. It might not be the sharp laugh-riot you want out of a Britcom, and it might be a little heavy-handed on the sentimentality at times, but in the haze of a Sunday afternoon, when the apple crumble is in the oven and you desperately want something to replace Antiques Roadshow, Eaten by Lions might be exactly what you fancy.